Dubai is known for shopping, theme parks, zoos & aquariums, nightlife, and beaches. Your plan includes some of its best attractions: take in panoramic vistas at Burj Khalifa, ponder the design of Dubai Fountains, get engrossed in the history at Al Fahidi Fort, and cruise along Sheikh Zayed Road. If you are flying in from United Arab Emirates, the closest major airports are Dubai International Airport, Sharjah International Airport, Al Maktoum International Airport and Ras Al Khaimah International Airport. November in Dubai sees daily highs of 36°C and lows of 26°C at night. Cap off your sightseeing on the 1st (Fri) early enough to travel to Kiev. Start off your visit on the 1st (Fri): don't miss a visit to Maidan Nezalezhnosti (Independence Square). 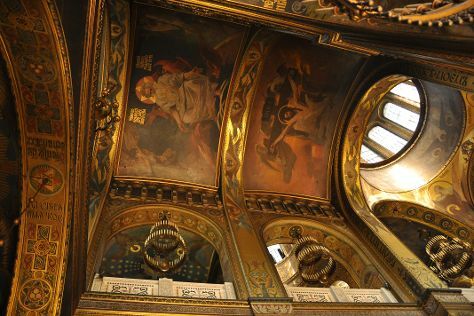 Here are some ideas for day two: admire the striking features of Bell tower of Saint Sophia's Cathedral, pause for some serene contemplation at St. Volodymyr's Cathedral, then examine the collection at Mikhail Bulgakov's Museum, and finally Head underground at Kiev-Pechersk Lavra - Caves Monastery. You can fly from Dubai to Kiev in 9 hours. Alternatively, you can drive. The time zone changes from Gulf Standard Time (GST) to Eastern European Time (EET), which is usually a -2 hour difference. Traveling from Dubai in December, expect Kiev to be much colder, temps between 0°C and -5°C. Wrap up your sightseeing by early afternoon on the 3rd (Sun) to allow enough time to travel back home.